HyperX, the gaming division of Kingston Technology Company, Inc., announced the HyperX Cloud for PlayStation®4 (PS4™) gaming headset. 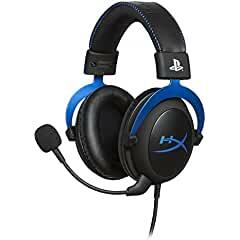 Officially licensed by Sony Interactive Entertainment LLC, the new headset is designed specifically for PlayStation 4 gamers with complementary PlayStation 4 blue color accents, and HyperX comfort. HyperX is an avid supporter of Esports and the gaming community as it develops products designed specifically for competitive gamers. HyperX recently expanded its award-winning lineup with the Cloud Flight wireless gaming headset, offering up to 30 hours1 of battery life. The new Alloy Elite RGB mechanical gaming keyboard offers per key lighting customization, macros and up to three light profiles, all customizable through NGenuity software. The new Pulsefire Surge RGB mouse offers pro-level performance with up to 16,000 DPI accuracy, featuring dynamic 360o RGB light effects using NGenuity software.